This premier nutraceutical formulation promotes healthy female support throughout the menstrual cycle and during menopause. This is a unique health-promoting formula that can be used as a key part of any practitioner’s foundational health support program for women. Take 1 capsule, 3 times daily. 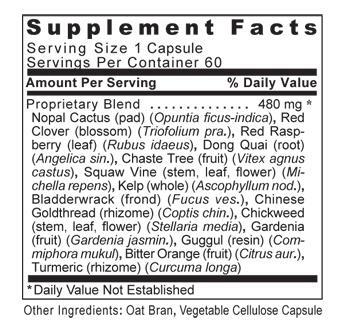 For special routines, up to 12 individual servings may be taken daily (1 serving = 1 capsule).